The DNR will add a lake, river, pond or wetland to the infested waters list if it contains an aquatic invasive species that could spread to other waters. 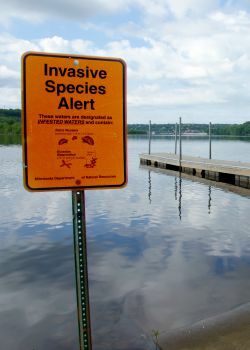 The DNR may also list a lake, river, pond or wetland as infested if it is connected to a body of water where an aquatic invasive species is present. To reduce the risk of spreading aquatic invasive species, activities like bait harvest and water use are managed differently in infested waters. Which lakes and rivers are listed as infested? You can download the infested waters list as an Excel spreadsheet . Last updated April 2, 2019. This Excel spreadsheet is the most complete version of the infested waters list and should be used for regulatory or permitting purposes. You can view an interactive map of most infested waters on the EDDMapS Midwest website. How many lakes and rivers are listed as infested? About 7% of Minnesota's more than 11,000 lakes are on the infested waters list. Less than 3% of Minnesota lakes are listed as infested with zebra mussels. As of October 2018, we have confirmed zebra mussels in 180 lakes and wetlands. We have listed 167 bodies of water as infested with zebra mussels because they are closely connected to a waterway where zebra mussels have been found. Clean all aquatic plants, zebra mussels, and other invasive species from boats, trailers, and water-related equipment. Drain water from your boat, ballast tanks, motor, live well and bait container. Remove drain plugs and keep drain plugs out while transporting equipment. Dispose of unwanted bait in the trash. To keep live bait, drain the water and refill the bait container with bottled or tap water. If you want to harvest bait or transport water from an infested water body, you may need to apply for a permit.